This utility logs keystrokes and is intended for legal use only. Using keylogging software in this category for malicious purposes is not intended, nor is it legal. If you weren't already aware of what a keylogger is, all you have to do is think about the software category and you would be correct to assume that it is a program which logs keys. More specifically, a keylogger logs the keystrokes of a user or users on a computer system and many in this category can also take screen snapshots and send it to a specified email address. With that said, IwantSoft's product "Free Keylogger" is essentially a freeware keylogger. It records keystrokes, keyboard activity, clipboard entries, Internet surfing and more on PCs running on one of the supported Windows versions (currently Windows XP, Windows Vista and Windows 7). Version 3.97 is a freeware program which does not have restrictions and it's free so it doesn't cost anything. For security reasons, you should also check out the Free Keylogger download at LO4D.com which includes virus and malware tests. Additional screenshots of this application download may be available, too. Keyloggers record keystrokes and take screen snapshots. 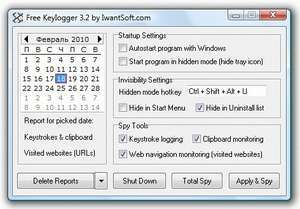 This categories contains the best free software download and review of the best keyloggers available for free download from the web. Check out some of the freeware downloads available in the keylogger category. They contain no strings and are available at zero cost. Free Keylogger has a presence on social networks.